A recurring theme in current threads is the suggestion that certain cars which we now consider as classics were notorious for rusting: Minis, Lancias, Fiats, Renaults, Japanese cars - they all seem to have earned a reputation for rusting away. But really, was there any car from the forties, fifties, sixties or seventies which didn't rust as soon as they hit the road? Anything, from Anglias and Escorts, through Victors and Minxes, to Rovers and Mk6 Bentleys, all could be seen rusting away before ones eyes before they were four years old. I recall always being told that postwar Vauxhalls were particularly prone to rust due to poor material quality. Wether thats true or not I don't know? The first 1957 Vauxhall Victors were notorious for rusting. Almost as bad as the 1960's Datsuns. They were a very smart modern design in their day but were beset by ferocious rusting. The exhaust pipe ended through one of the styling circles at the ends of the rear bumper. The whole lot would rust away! I think 1950s/60s Victors are very thin on the ground relative to their competitors from that period. Lancias were famous for rotting away in the 1970s (didn't the company end up buying many of the Betas back again?). You'd think that the rust situation was well under control now (electronics usually being the most fragile part on an ageing modern), but Nissan bucked the trend with rampant chassis rot on their mid-2000s Navara pickups. Recent(ish) Citroens have also had their rust issues. In the 80's a friend of mine had a newish Fiat Panda (hardly a classic i concede)that would rust badly, not only in all the usual areas, but also in places like the middle of the roof panel or bonnet for no apparent reason. The first 1957 Vauxhall Victors were notorious for rusting. I emigrated to Canada in 1964 and an abiding memory was in the first days that I was there I had to go and register at the Dept. Of Labour. Outside the building there was a Victor and it had rusted through in a line from the rear window to the wheelarch and it was held together by a length of perforstrip and the rear springs. That’s what’s missing from Rick’s Datsun picture. Perforstrip. In 1983 a friend, passionate about Alfas, took me to Roger Clark's showroom at Narborough to look at a new GTV. 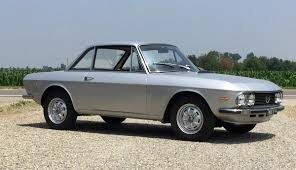 I had been doubtful anyway given the history of Alfasuds and Lancia Betas but went along eyes wide open. The car was sitting there, resplendent in red with beige interior - and the headlamp reflectors were already brown with rust. Needless to say I gave it a wide berth. When he submitted it for it's first MOT in 1974 it passed after extensive welding to the nearside sill and floor and was warned about imminent rust about to break through in the front and rear wing arches. 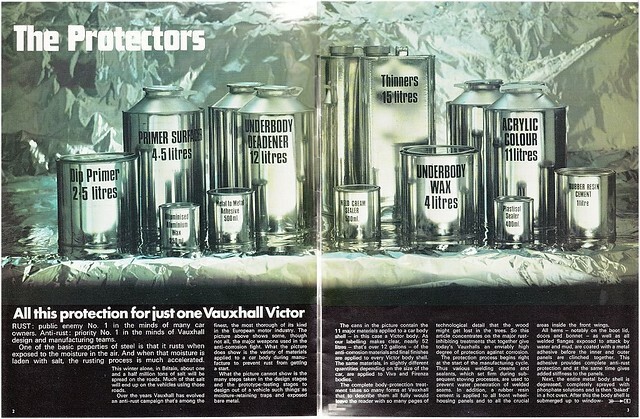 He part exchanged it shortly afterwards for a new Vauxhall Victor FE. By the way, looking at Rick's Nissan Navara photo, the problem isn't confined to Nissan, have a look at this chassis from a modern Isuzu 4 door pick up. I've had five classic Range Rovers, all of which suffered from rust, but the last two were special long wheelbase models, called LSE. Both of them rusted to oblivion, but in places which could not be detected without stripping out carpets and seats, so could not be an MOT fail until it was too late. Nissan also offered to buy back or repair these Navara's...albeit after some negative publicity, still very surprising that a post millennium vehicle would suffer this way. Back to classics I remember my dad cursing that his 3 year old Austin 1300 failed its mot with corroded sills. I can pretty much guarantee that, at each show or meet I go to in the Singer, someone will take great delight in telling me how the floors always rotted out of the various roots offerings. Mine however has never been welded nor does it have any rust, it does have lots of grommets through which the previous owner used to squirt oil. I don’t think it ever seen roadsalt either. I know Vauxhall did have quite a reputation in the seventies, which was probably carried over from earlier cars. But it wasn't for lack of trying - they made a big thing about how much corrosion protection was put on the vehicles, to the extent of printing a brochure about it. I wonder whether that led to a false sense of security, with owners not bothering to check the underbody sealant for damage. I know on my cars (Viva HC shell) there are shields behind the front wheels to stop mud getting in the wings, but they rot, so mud gets trapped behind the remains of the shields where it can't be seen. If the shields couldn't be made of something more resilient, they'd almost have been better off not fitting them, so it would have been easier to clean out and inspect. My local breakers yard has hundreds of these that are ready for breaking, No doubt they are all buy backs from Nissan. 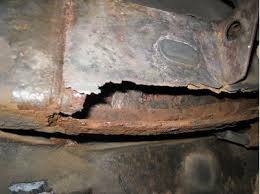 A major contributing factor in the rust reputation on all models is the treatment of the car. Many cars gain a reputation for being either bulletproof or rubbish and it is these that get neglected the most and by the time a problem is bad enough the car cannot be used, it usually is much too bad to warrant fixing. It works the other way too, there's a belief that Reliant Scimitars never rust because they're not made of steel. A similar belief exists that Landrovers aren't prone to rust due to their aluminium panels. We all know how wrong both these beliefs are. That said, Herald era Triumphs are temples to iron oxide. I'm yet to see a Herald, GT6, or similar that hasn't got rust problems in the floors, arches, valances, gutters, and windscreen surround. The obvious exception being those cars that have been meticulously restored, of course.